We just got back from a family road trip to Sacramento for a mini working vacation! I had a blog conference I wanted to attend, so the husband and kids tagged along so we could spend some family time together first. We also have taken several mini trips to Oregon for long weekends and camp for the kids. 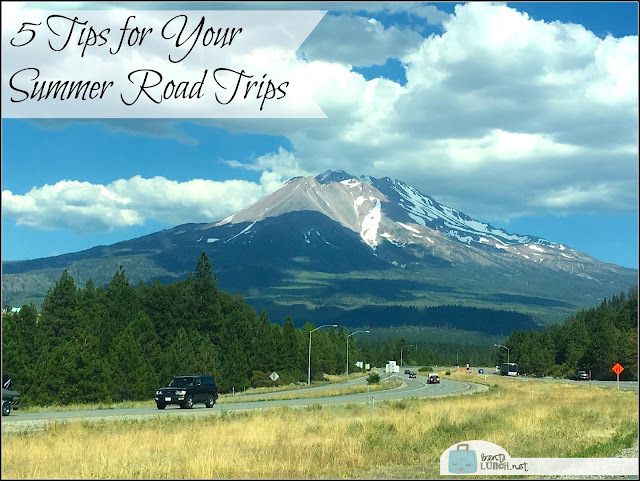 Basically, there's a whole lot of driving going on and that's why we're sharing our favorite road trip tips with you. #1 - Pack a cooler with lunch! Vacations are full of opportunities to eat out and the road trip back home usually means fast food, but the road trip to our destination? I prefer to bring lunch. We fill our cooler with easy to eat items, usually non-messy sandwiches packed in individual sandwich boxes. No one enjoys a squished sandwich! We also packed fruit cups and applesauce pouches to balance out the meal, plus some chips and fish crackers in case we needed salty items. The kids chose drink pouches and the husband and I opted for water bottles. Other than my sandwich boxes, we did utilize disposable products to make the mess easier to contain. This is my most favorite road trip tip with kids. Pack snacks in shoebox sized plastic container before you go. This way, everything is stored in one place and nothing gets squashed or crumbled. It's much easier to pass the box around the car than digging through a bag of snacks. What's in ours? Granola bars, other snack bars, cookies, fruit snacks, crackers, and more of those kinds of items. 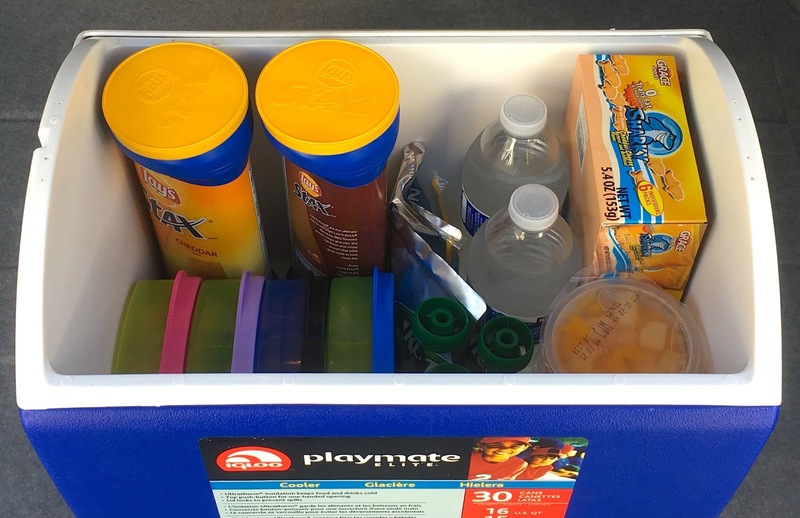 Because we were planning on taking the kids to an amusement park, we wanted snacks that could also be put in pockets or purses, hence the variety (and lack of melting items) and we packed two separate boxes to ensure we had enough snacks. #3 - Pack other necessities! Three things I always alway always pack? Napkins, grocery bags for trash, and scissors. These are always the things I end up needing if I forget them, so they are on our must-pack list every single trip. Other necessities include baby wipes, tissues which I remove from the cardboard box and store in an old baby wipes container, and some type of aspirin or similar for headaches. When the kids were younger, we always kept spare clothes handy too, but we haven't need those in years, knock on wood! #4 - Get your oil changed! Depending on the length of the trip, we get our oil changed before, after, or both. It just depends the timing. Our road trip car is usually my husband's 2007 Highlander Hybrid (mine is a 2014 Rav4, so we prefer to put the extra mileage on the older car). It's still in great condition and runs like a dream, and we really want to keep it that way. Since his car has over 75,000 miles on it, we love using Pennzoil® High Mileage Vehicle® motor oil which helps clean out the sludge lesser oils leave behind and helps reduce leaks and oil consumption in worn or higher mileage engines. We use the Walmart Auto Care Center so we can drop off our car while we shop for all our road trip food and snacks while we wait. 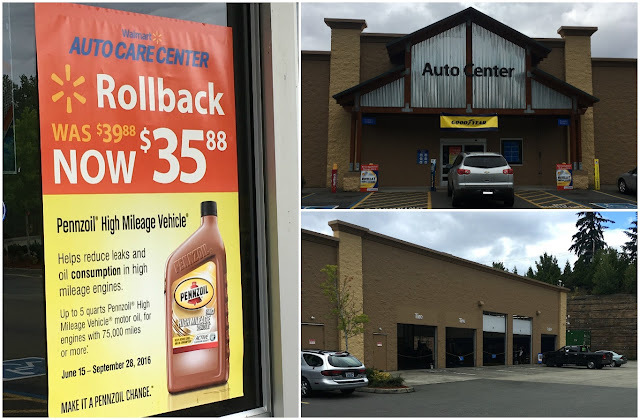 Right now, through September 28, High Mileage Pennzoil is on Rollback at Walmart, (from $39.88 on Rollback to $35.88). #5 - Go old school for entertainment! My kids, like most, love playing with their tablets and such on road trips, but I don't love all the screen time. This year, I picked up some Mad Libs games for the car and was amazed at how long it kept them entertained. I used to play that with my brother on road trips and it always amused us. In the semi-tech area, my friend also recommended apps that allow you to play the license plate game and keep track of the ones you've seen. We used to play it with a paper and pen, but I kind of like the ability to record it (and on the screenshots she sent me, it keeps track of all sorts of stats). I think it could be a fun mom smartphone addition. We'll definitely be downloading this one for our next road trip! We also have printed maps the kids use to color each state they've been to over the years. Between moving with the Army and road trips, they've been to over half so far, with more to come. I also add in Sudoku and crossword puzzles for them, plus new books. We also do have some screen time, I just don't want it to be the entire drive! Do you road trip with your kids? What are some of your best tips to make it a successful experience? We were shocked to see Alaska and Hawaii on our road trip! So wish we had been able to mark off all 50! Were you near a military base? We have tons of those here. Our actual neighborhood has very few Washington plates. We have Texas as do our next door neighbors, behind us is Tennessee, across the street is West Virginia, down the street is Maryland! And thank you so much for the screenshot!!! !